I am not sure exactly what I thought when I started Oliver Quinlan’s The Thinking Teacher, but a part of me wondered whether maybe it would be a step-by-step guide on how to teach the art of thinking, incorporate it within the curriculum, assess it, measure it. And in many respects it was, just not in the manner that I expected. Unlike other edureads which set out to provide some sort of defined answer, slowly unpacked across one hundred odd pages, Quinlan provides a book of questions and beginnings. It is not as much about the answers as it is about the act of reflecting. Touching on a range of different facets central to education, such as the lenses we apply, the purpose to learning, planning for learning and what might constitute success. The book never feels like a lecture or a diatribe, but rather an invitation to get the reader to think for themselves, providing alternative points of view to get things started. Asking questions that we do not know the answers to can lead to change – either a change in how we interact with the world or about how we think about the way it works. The succuess of this book is not because it provides a series of checklists or resources in the appendix covering all things thinking, but for providing a context to reflect, wonder and imagine. 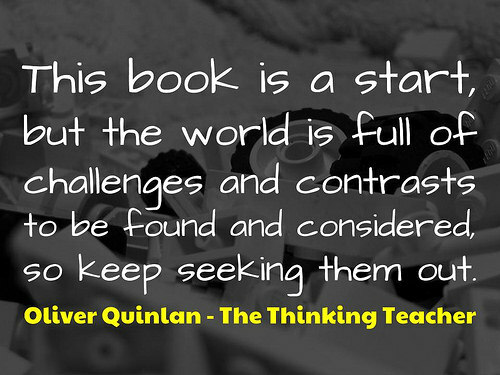 REVIEW: The Thinking Teacher by @OliverQuinlan by Aaron Davis is licensed under a Creative Commons Attribution-ShareAlike 4.0 International License.